When I was planning our daughter’s Cat in the Hat birthday party, I wanted to do a dessert table in red and blue. As you already know, there aren’t many naturally-colored foods that come in blue. There are blueberries. And then there are… no, that’s pretty much it. Blueberries. I also wanted to make macarons (actually, I wanted to buy them but my party budget had other ideas). 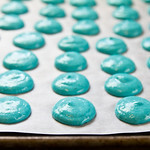 After doing a little research, it seemed best to opt for powdered food coloring over liquid for such a vibrant colored cookie, so as not to risk disrupting the temperamental high maintenance delicate moisture balance in the macaron shells. So I put Kool Aid into delicate, fancy French cookie batter. Because powdered food coloring was nearly $10/bottle. I’m pretty sure I haven’t had a glass of Kool Aid in at least 15 years. At least. But it has powdered food coloring so it took care of both flavoring and coloring the macaron shells a pretty red and blue (I did add a pea-sized drop of Americolor Red Red to the Tropical Punch and the tiniest drop of Americolor Yellow to the Blue Raspberry Lemonade to get more of an aqua color than light blue). It’s a very, very odd experience to open your oven and get hit with the smell of hot tropical punch but the cooled cookies are filled with a lemony buttercream – fun, fruity, and matched the party’s color scheme perfectly. 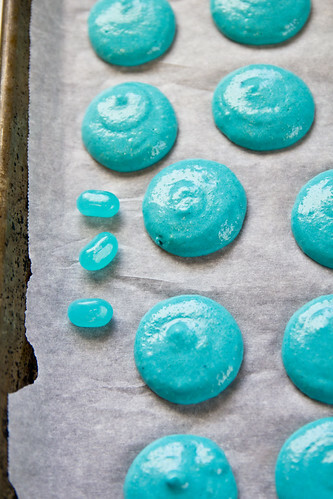 And I mean exactly perfectly – I joked on Twitter that I must have been a paint color matching machine in a previous life because my macarons matched the blue Jelly Belly candies perfectly. I wished that talent carried over into decorating… our old house had 5 different shades of yellow/tan downstairs. And only two of those were supposed to be different. Powdered drink mix yields a fun, fruity, vibrant-colored macaron. Pulse the almond flour and confectioner's sugar several times in your food processor until thoroughly mixed. Place your aged egg whites in the bowl of your stand mixer and whisk until foamy. Add the sugar and turn the mixer to high, whisking until you have a glossy meringue. Add the Kool Aid and food coloring, if using, to the egg whites and let the mixer run a few circles through the batter to distribute. Fold the dry ingredients into the egg whites gently, briskly at first to break up the meringue a bit, until thoroughly mixed. The batter will be a little lumpy but will relax. Transfer the batter to a piping bag fitted with a large round tip and pipe rounds of 1.5 inches along two parchment-lined baking sheets. Let sit one hour at room temperature. Not more than 24 hours before serving, pipe 1-2 tsp of frosting onto one cookie and top with the other, gently pressing down. Store tightly covered and serve the next day. It seems easy to make. My two daughters will be thrilled. These are so pretty! Awesome. You are so talented! Love the colors! I love these! I’ve never tried my hand at macarons due to their fickle nature. But I would totally try it for something as fun as this! Adorable. these are so cute! the colors are spot on to cat in the hat! great job. Oh man, you hit the money spot on the blue kool-aid!! I absolutely love them, and how cool would these be for 4th of July!!! Looks like one amazing birthday party, and I’m pretty sure these macarons were the talk of the party…on top of everything else that you did!!! Love that there is koolaid in these. These are just too adorable! Perfect for a Cat in the Hat theme. Can’t wait to see how the party turns out! awesome! 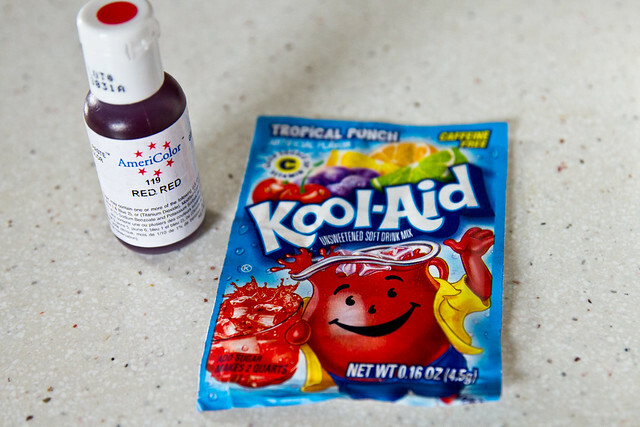 i’ve actually thought about adding kool-aid to something but i’ve never done it. i love the cat in the hat party idea. we read Cat in the Hat every night before bed. 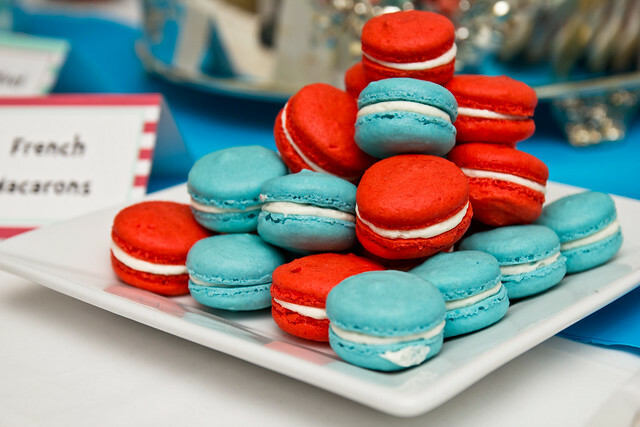 Wow, I love your creativity and resourcefulness; who would’ve ever thought of using Kool-Aid in macarons! I am really tempted to try this on Saturday! Yum they look delicious! And those flavors really tempt me!!! These are fabulous! Love the originality of the flavors. I’m terrified to make a macaroon…I have a book on them and everything…Hopefully I’ll get the confidence you have to do them!! So now you’re basically either a macaron heretic or a macaron rockstar. Or both. I love it. These are awesome! I love the idea of flavoring and coloring them with kol-aid; especially for a kids party! Great job! i cannot believe you made these. do you know i have yet to make these? I love these!! Do you have the conversion measurements for the sugars and the flour? How many cups do the gram measurements equal? Thanks!! I just made these for a kids birthday party. You have to add a lot of red food coloring to get them the correct color. Most people found them too sweet and the flavoring a bit strong. Not sure if the concetrated flavoring of Kool-Aid was a bit much. Might suggest using only half the packet. I’m definitely going to have to try this out!